Is Photoshop CS2 Worth It? 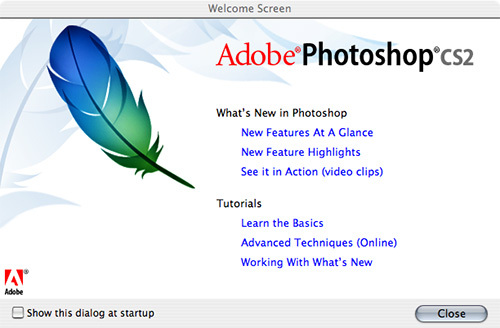 Photoshop CS2 will be the tenth upgrade of Photoshop that I have purchased over the past ten or so years. Earlier releases were uniformly greeted with great enthusiasm (in Photoshop 3.0 - Adobe gave us Layers; in Photoshop 4.0 - they gave us Adjustment Layers; and in Photoshop 5.0 - they provided Color Management). But recent releases have often be meet by a significant amount of scorn and complaints about the lack of really interesting new features; a quick scan of various digital photography websites, Blogs and forums reveals a modest stream of complaints about the limited new features in the latest release of Photoshop. Well, I’d like to make the argument that Photoshop CS2 is overwhelmingly worth the upgrade price, and introduce you to a few of the features that I think make my photographic life easier. I’ll argue that 1) Photoshop is the cheapest part of my digital expenditure over the years; and 2) that upgrading Photoshop saves me so much time that it can pay for itself quickly. Maybe my arguments sound a bit pedantic, but I merely want to put the value of Photoshop into some perspective vis-a-vis other parts of the digital workflow. I think of Photoshop as overwhelmingly the cheapest part of my photography laboratory. Now that all of my photography is somehow processed digitally; my entire digital workflow is broken into three basic components - capture, edit, and printing. All of these are equally important pieces of the overall process - yet the edit step actually requires a much smaller capital expense - and I am a cheapskate on equipment - and essentially no cost in consumables. I think I have spent about $1500 on the original purchase and upgrades for my primary license of Photoshop over the past ten years or about $150/year - and I have spent way more money on computer hardware to run Photoshop in that time. I often recommend buying the cheapest computer (rather than the speed demon) for digital image editing; I am writing this article on a discounted bottom of the line iMac G5 that is more than fast enough for processing my image in Photoshop CS2 (and yes I did add more memory). This new computer set me back about $2000, and I expect to use it for the next three years. And I certainly think the upgrade to Photoshop CS2 will improve my productivity much more than a new computer. Think about whether the upgrade for the next release of Photoshop (about $150) is worth more than 1/10th of a fancy new computer. And this doesn’t even include the cost for the capture and printing parts of my workflow. Digital cameras, digital wallets, memory cards, printers, ink, paper all cost significantly more than a computer and a copy of Photoshop. Maybe I have spent less money on my array of pinhole cameras than I have spent on Photoshop; but I have certainly spent several thousand dollars on the film and processing that had gone through these cameras. Each successive upgrade of Photoshop has also make my life much cheaper in terms of time spent editing images. I do enjoy editing images, but I feel that my ability to create excellent images is best served by going out and capturing new images; processing them efficiently; and making excellent prints - and then going out and capturing more images. I still do most of my image work in Photoshop; since it is really the best tool available for the type of image editing work I prefer; but I want my image editing to be as efficient as possible. Each new release of Photoshop makes my editing work more efficient. Photoshop CS2 has added a number of excellent new features; some of which might appear fairly small; but each makes my life easier and my image processing faster. I am certain that my computer spends 99.99% of its processing power waiting for me to make a selection, or an adjustment, or pick a color, and so on (there are small moments where my computer must really work hard processing images, but these are fairly infrequent). But a simple, new tool in Photoshop really can make image processing faster. So, I run to buy each new release of Photoshop. Even the simple new features often make my processing so much easier that I want to get them into my workflow quickly. And the cost of the upgrade seems so small that I don’t even account for it. (I am still trying to justify the purchase of a new Nikon D2x). Be happy that Adobe has released yet another version of Photoshop. I to wish that they might have included some features that I have dreamed of - but there is still the next release. 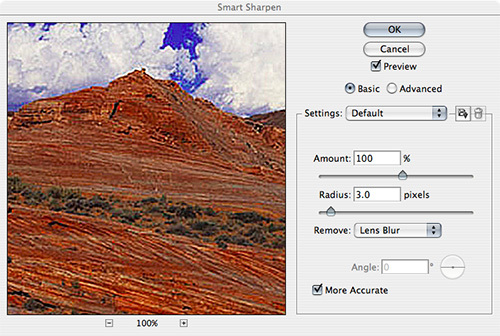 Smart Sharpen is one of the few features to come to digital photography that may actually help make better images. The new Smart Sharpen filter in Photoshop CS2 can actually perform an iterative deconvolution on your image - or actually sharpen the image. And it is a very easy tool to use. I get good results setting the filter to use the Basic settings (although, definitely turn on ‘More Accurate’). With these basic settings, smart sharpen will truly sharpen the image (not add edge contrast as the unsharp mask does), protect shadow and highlight detail, and prevent halos from appearing in the image. It is really that simple. The spot healing brush takes the healing brush one step further; it guestimates the appropriate source point for healing without requiring you to alt/option click on a ‘clean’ part of the image first. So, you just need to turn on the spot healing brush and start clicking away on the spots of your image. Plus, the spot healing brush includes a ‘sample all layers’ option, so you can spot onto a new layer and preserve the original background layer. Just as with the original Healing Brush, the Spot Healing Brush can still sometime mess up and create an obnoxious smear, so you may need to use an alternative method for removing a spot, but for most problems the Spot Healing Brush is just a quick click. 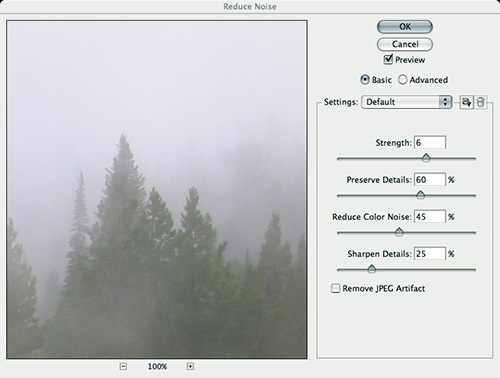 The reduce Noise filter is a great addition for common, minor noise problems in digital camera images. This is especially good for minor pixillation in smooth areas, and minor chromatic fringes from many digital cameras. This is an easy filter to run on many digital camera images that have some minor noise issues. Very specialized noise filter tools still seem to work better for very problematic images, like those shot at very high ISO. Photoshop has long had way too many menu options; although there is certainly no consensus on which menu items are too much. 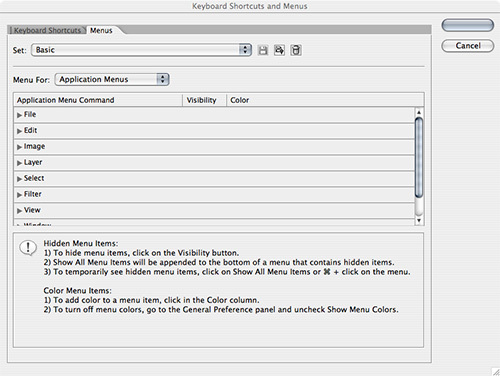 Photoshop CS2 allows for menu customization to simplify the menu - it is easy to hide or display menu items and show key menu items in color. I have merely gone into the Edit/Menus dialog and set the Set to ‘Basic’; this gives the most important menu items for image editing without all the extra features. Over time, I have gone back and added a few additional hidden menu items that I still use frequently enough, to get my own custom interface. This is a new feature that has received a lot of criticism for not providing even more customization. Sure, I would like to rearrange and rename large parts of the Photoshop interface, but the menu customization in Photoshop CS2 is actually a fairly good start. In Photoshop CS2, Camera Raw adds some good automatic exposure, contrast, shadow and brightness functionality. 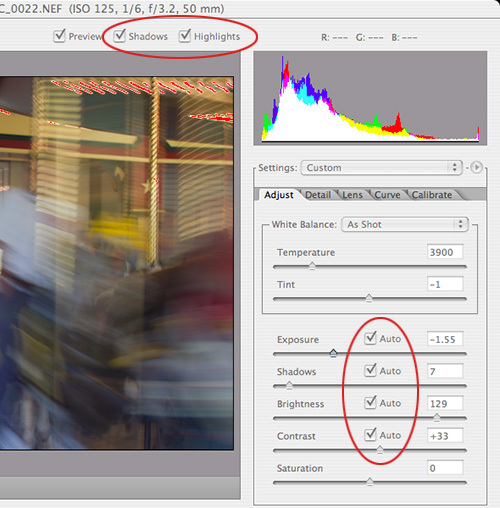 In general, the Auto settings are very similar to the basic adjustments that I would set on a typical RAW image file to get a good overall histogram. By setting these Auto settings by default, my RAW images are opened with a reasonable starting histogram; often, I will merely accept these auto settings, open my image, and start editing; or I can make minor adjustments to these settings to make minor improvements to my image. Quick and easy. Camera RAW also adds clipping warning for shadows and highlights similar to the clipping warning found in the Levels dialog (via the alt/option key). I just keep these turned on by default to make it easy to see any shadow or highlight clipping. Adobe Camera RAW now allows for easy editing of multiple RAW images. Just select and open a series of similar RAW images, and Camera RAW will open with all of these images available for editing. You can choose to process all of these images with all the same settings, or set some basic settings for all the images and manually adjust others for each image. I typically set the temperature and exposure the same for all the settings, and then walk through each to fine tune the additional exposure settings. Once you have set all the settings, you can open all the images together in Photoshop CS2; or better yet, save the images into DNG, TIFF, JPeg or Photoshop files with all the appropriate processing; this allow the RAW images to be processed in the background. I typically select 5 - 40 images from a particular shoot, walk through the basic adjustments in Camera RAW, startup the processing of all the images, and open up the first image in Photoshop for editing (once it has been quickly processed by Camera RAW). 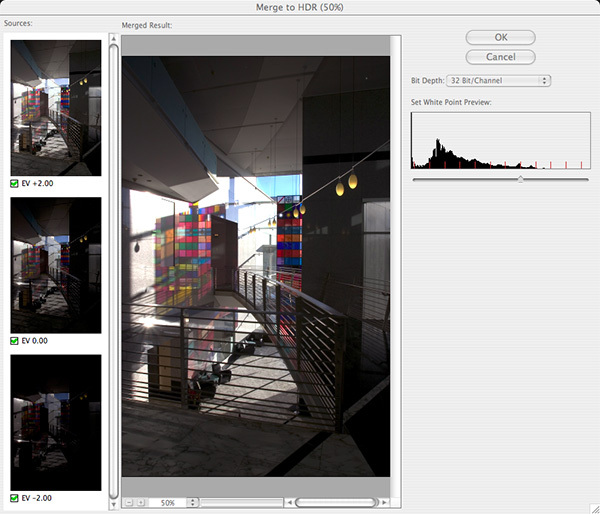 Editing multiple images in Camera RAW 3.0 has definitely cut my time for RAW processing images in half. Adobe Bridge replaces the Photoshop Browser as a general purpose image browser tool. I find the main advantage of Adobe Bridge is it makes it easy for me to move, rename, tag, keyword, sort, etc all of my images before I open them in Photoshop for editing. 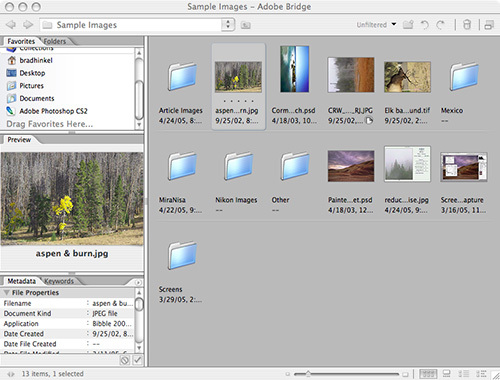 Adobe Bridge can be used as a simple, but effective tool for image cataloging and management. I will use an easy cataloging tool like Adobe Bridge, and in the end, good cataloging saves time. Merge to HDR is one of Photoshop CS2 cool new features. Merge to HDR creates high dynamic range images - scenes will more exposure range than would normally fit in a single exposure; it takes multiple similar images shot at different exposures and merges these together to create a single image where the highlights and shadows both appear. 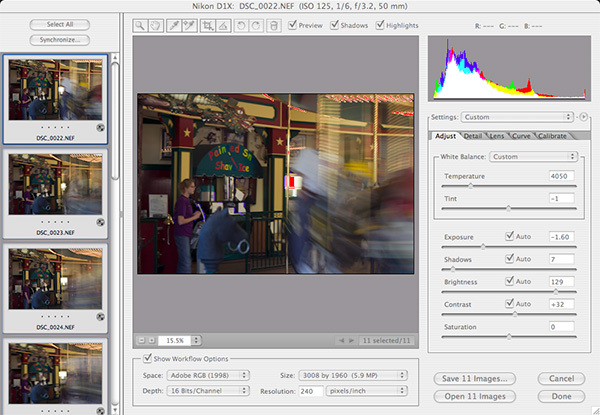 For most image sets shot properly, you merely run Merge to HDR, select the images, and run; Photoshop will create a 32-bit high-dynamic range image from these source files; even easier than PhotoMerge. And Photoshop will properly build a HDR image the compresses the overall contrast while maintaining texture and edge contrast (mimicking the way the eye deals with HDR scenes). This is good technology. I want to acknowledge that I am trying to make my point about the value of Photoshop CS2 primarily from the point of view of a digital photographer who really wants to focus more on images than technology – ironically, I find that iterative increases in Photoshop technology have made my life as a photographer easier. But I have also been a software engineer (working for a large software company outside of Seattle), and I do understand many of the complaints directed against Adobe – I have heard some good ideas for new features – some of which sound very difficult to do well, but many of which are probably very good ideas. And I do believe that Adobe Photoshop is one of the great software monopolies of our time; and Adobe has a strong hold over the digital imaging marketplace. Yet, if Adobe would fail to keep creating a great product, things can change fast – there are other companies in the industry that could create a competitive product once they see the opportunity. I am very intrigued by the Core Engine features announced in Mac OS X Tiger; soon, video cards may make the imaging engine in imaging applications mute, and software companies will have to make imaging software with good interfaces. Finally, I think we the instructors, writers, and pundits of the digital photography realm have some blame as well – one advantage of the dominance of Photoshop, is we don’t have to look any further than Photoshop for all our classes, books, and articles – but there is other good technology out there and merely taking a look at some of it, and talking about it, will make Adobe notice and hopefully, make the industry more active.